See all of our tub chairs, many available on our Next Day delivery service. Traditional occassional chair with deep curvy lines. 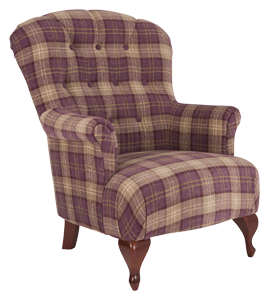 Upholstered in a stunning Tartan wool look check fabric, in a choice of 4 colour ways. The chair is complimented with stunning shapely front legs in a warm mid brown colour. A great little compact occasional winged chair with complimenting lumber cushion. 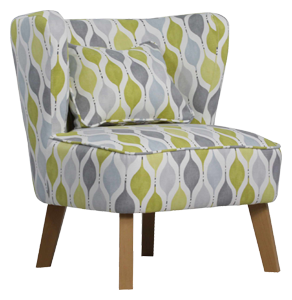 Upholstered in a printed cotton with a retro pear drop design in 4 colourways or a selection of colours from our Merlin velvet range. Offered with Wenge legs as standard with natural on request. 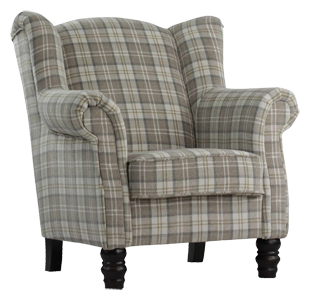 Our popular wing chair has been extended with an choice of 2 natural colourways in our Highland wool felt feel fabric, in addition to last years tartan colours. The chair comes with 4 dark brown legs, which only require hand tightening. 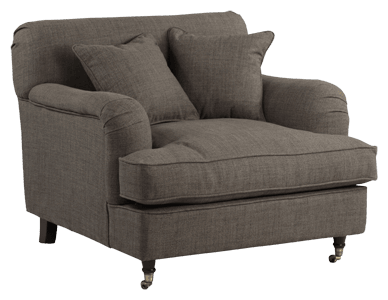 A well proportioned a shapely sofa, ideal for those concerned about depth. Offered made to order in any of our house plain fabrics. A classical English shape, the Bridgford range offers great style and comfort at a remarkable price. Self coloured scatters included, upgrade to feather scatters available at an extra cost. Large range of plain fabrics. XYZ Agencies Ltd are a leading furniture manufacturer based in the heart of England. We produce a comprehensive range of upholstery & service over 300 independent retailers, in addition to providing production for several groups and contract specifies.